@luba - Bagels have long been commonplace in NYC, so if you grew up there you could be forgiven for thinking they were available everywhere, or were perhaps a regional quirk. In fact, though, they originated in the Jewish communities of Poland and eastern Europe. Hi! ethnic food? what country? A few months ago I watched an old YouTube film about authentic bagel making filmed in a Jewish neighborhood back in the 1950's I think it was. On Sunday mornings Dad would go out and get bagels,cream cheese and lox. He only bought 1/4 oz. of lox as it was expensive. My brother used most of the lox on his bagels and we would argue about his excesive portions Dad passed away in 1971. No more bagels and lox on Sundays. In KC, go to Einstien Brothers. After ordering a bagel with coffee a couple of times in the South and Midwest and confusing some poor waitress, I realized that bagels were a regional thing. Even now that bagels appear in menus on the "outside", one never knows when one is going to get some donut shaped bit of spongy white bread with no crust. If someone wants to eat that stuff, I don't mind at all. I just wish they'd give it another name so those of us who know what a bagel is won't get disappointed or angry when one of those things arrives instead. If it falls apart when dunked in coffee or it seems you could eat it without teeth, it's not a bagel. When I first lived in the Northwest, I saw a sign by the side of the road advertising smoked salmon at an outrageously low price. I figured since they can fish the salmon right here that they might be able to sell it that cheap. What I got was definitely smoked salmon but definitely not lox. It was nice, pink chunks of salmon, some of it with scales still on it, that had been smoked rather dry. This type of smoked salmon is good with a schmiel of cream cheese on a slice of thin pumpernickel bread--the kind you buy refrigerated, If you can't find reputable bagels, the pumpernickel is IMO a better choice. 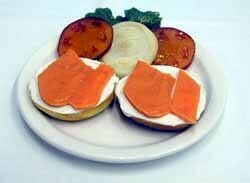 For a good lox & bagels fix in Northern California to Seattle, there is Noah's ( http://www.noahs.com/ ). In Portland, OR there is Kettleman's. The proprietor is a Chinese man but it's called Kettleman's because they BOIL their bagels in a kettle; and how many first-time customers is a bagel place called Wong's likely to bring in?